The planned launch of the space shuttle was moved to Monday after unfavorable weather conditions put on the alert the mission controllers. STS-130 had been scheduled for liftoff at 4:39 a.m. on Sunday but low-level clouds moved into the area in the hours before the launch. Flight conditions moved from "red" to "green" and finally back to "red" in the 90 minutes before scheduled departure. Winds were unpredictable, with speeds ranging from 5 mph to 12 mph. NASA will try again at 4:14 a.m. Monday. 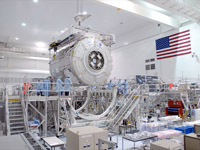 The shuttle Endeavour will carry two large additions to the International Space Station that will bring the orbiting craft to near completion. The largest, at 15 feet wide and 23 feet long, will add another section to the ISS. It will provide space for the station's environmental control equipment and add another bathroom. The second add-on, a 6.5 foot by 5 foot cupola, will allow astronauts a 360-degree view of robotic operations on the outside of the craft.